Arnie (not his real name) was a regular visitor at the little church I pastored. I often welcomed him into the church boardroom which functioned as a vistor’s parlour where I would offer him a cup of tea or coffee and something to eat…sometimes it was a slice of pizza leftover from an earlier committee lunch meeting. But Arnie rarely had an appetite for food. His suffering was too great, intense and immediate to enjoy the simple pleasure of food. What he wanted was whatever money I could spare so that he could go to the liquor store. He needed the alcohol to numb the unrelenting pain. Then, without warning, a week passed and then another with no sign of Arnie. I wondered what had become of him. He had talked about wanting to go back home to his people’s First Nation Reservation in Saskatchewan, and so I hoped against hope that he had finally got his “ducks in a row” in order to make his dream come true. But I also I feared the worse. You see, Arnie was homeless and it was getting cold at night. I imagined him lying dead in an alleyway after succumbing to hypothermia or worse yet, beat up and left for dead in a ditch. I finally called the RCMP to put in a missing person report. The officer informed me–with a prejudicial tone and sarcastic edge that shredded any remaining vestiges of my idealized hero’s image of the RCMP–that Arnie was staying warm and dry at a regional correctional centre at taxpayers’ expense. The officer assumed I shared his jaded view, that Arnie was not one of “us” but rather a free loading criminal who belonged to the world of “them.” But to me, Arnie was a friend, a child of God, and I was simply relieved to learn that he was alive and relatively safe. I would eventually see Arnie again, at his request. This time, however it was me who came knocking on his door, or rather his warden’s door at the correctional centre. Had Arnie been at his home in Saskatchewan I’m sure he would have taken great pride in saying, “Welcome to my parlour,” or something equivalent. 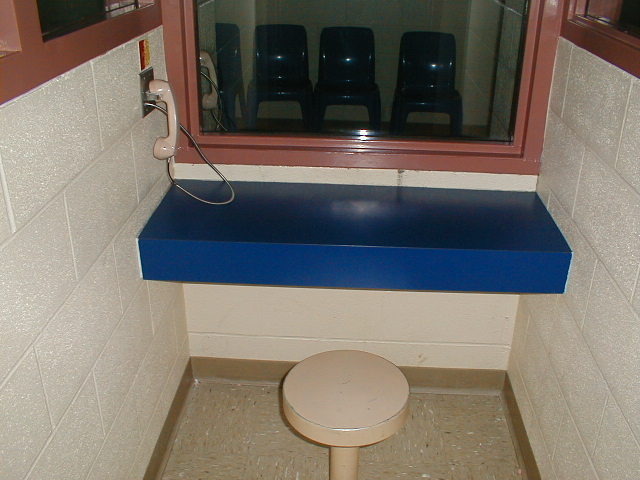 Instead, with his head down, a prison guard ushered him into a visitor’s cubicle very similar to the one pictured below. Vic Toews is right to be concerned about recidivism rates. But it’s not the pizza parties that keep some coming back. Arnie taught me that something much more basic is at stake. In our visit, Arnie admitted that he deliberately got himself arrested in order to have shelter and safety during the wet and cold west coast winter. And he is not an isolated case. 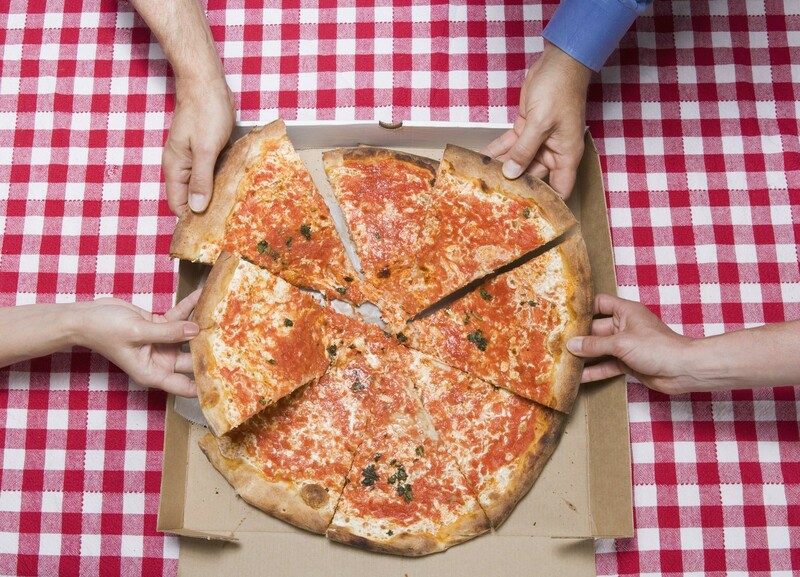 It’s not the pizza that keeps repeat offenders coming back, but a respite from the streets – especially in winter. Whether or not they get “coddled” by the occasional pizza or chicken takeout dinner will make not an iota of difference to these repeat offenders. Even restrictive regimes become tolerable for the sake of shelter from the elements. Rather than giving us a picture of uncomplicated evil, Aboriginal inmates–who continue to be over-represented in Canada’s correctional system (27% in provincial custody and 20% in federal custody) illustrate the complicated sources of crime. All share a background of childhood deprivation and trauma characterized by parental absence, severe poverty and physical and sexual abuse. Using language such as “ordinary Canadians” versus “criminals” Vic Toews makes it all too easy for us to cast our punitive gaze solely on the offender rather than seeing “the offender in relationship to Canadian society of which he or she is a troubled part,” as Baird rightly points out. It was not always so. Back in 1971, Eldon M. Wooliams, the justice critic for the Progressive Conservative party recognized that crime is a community problem and the community needs to participate in the solution. …crime is not just a sordid happening but rather a result of human behaviour brought about by our economic and social conditions which we have failed to change. ….crime is not only the fault of the prisoner but the fault of society as well. Everyone is born as clean as a white piece of paper. 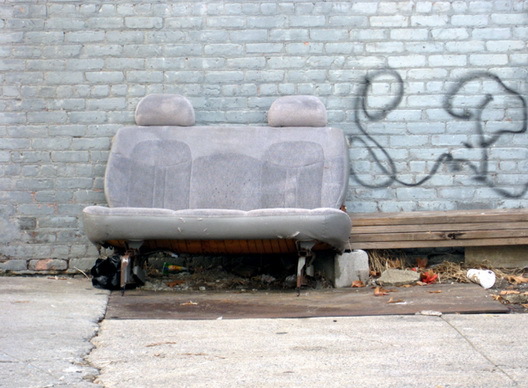 It is society that creates the environment which leads to crime. You can read more excerpts from Wooliams speech here. Last Friday, in his announcement of legislation that would make it tougher for high risk offenders with mental illness to get unescorted day passes, Prime Minister Harper spoke of the unbalances in the justice system when it focuses solely on the rights of the person convicted of the crime while ignoring the rights of victims. While I support our government’s desire to make the justice system more equitable, I pray that its field of vision continues to expand beyond the “offender – victim” dichotomy to encompass the responsibility Canadian society bears in creating the conditions, such as poverty and homelessness, that contribute to incarceration in the first place–especially among our aboriginal citizen population–and to work towards solutions to eliminate them. Due to a technical oversight, the comments for this post did not make the ride over with the rest of my imported content from Posterous. Thanks Vida. This is a great post, even though – or perhaps because – the whole scenario is so frustrating. As i read it, I also thought of indigenous parents who were incarcerated for not sending their children to residential school: folk for whom going to prison becomes a badge of honour. Toews is so adrift on this file that it is embarrassing to the nation. Thank-you for taking the time to respond. Yes, Frustrating indeed when Vic Toews pits public safety against the rehabilitation needs of offenders as if a rehabilitated former prisoner is not in the public interest. Sheesh.